In our struggle for justice and dignity, the facts should be a tool for moving hearts and minds. All too often, however, the way we employ facts actually makes misinformation stronger. In order for our advocacy to work toward our goals, we need to learn how to properly employ facts. In this piece from NPR’s social science desk, we learn how the practice of piling on facts to try to win people over works against our efforts to battle misinformation. Advocates know that accurate information is necessary to right wrongs and address injustices. After all, we can’t save our plant from climate change when so many people believe climate change is a hoax. So how do we get around this tendency and lead people in the direction of accurate information? Feelings move us more readily than cold logic. When we listen with our hearts, we’re more open to facts than when we listen with our minds. Advocates must learn this lesson and begin to use tactics that connect with the hearts of those we want to move. Only then can we give the facts a fighting chance. That’s why communicating personal stories in our advocacy is so powerful. When the challenges and triumphs of an individual’s story illustrate a larger injustice, audiences often soften their hearts and are more willing to consider the facts surrounding the injustice. We don’t always have stories to draw from, however, so we need other techniques. Another way to use emotion is through values. As the Opportunity Agenda explains, “Values are our most fundamental principles, the ideas so essential to our personal and national identities that violating them seems unthinkable.” Because they are so core to who we are, our values are closely connected to our emotions. For example, using the phrase “We the People” in connection to activism and organizing is mobilizing across the political spectrum because it evokes values of voice and participation that are core to how we think of ourselves as a nation. We can’t always share stories, but we can always lead with values. In your media and advocacy communications, resolve to always lead with values where you need to move hearts, minds, and policy. Learn more about how to lead with values and employ emotion in the service of facts on the Opportunity Agenda’s website. With social justice wins being attacked seemingly on all fronts in the US, it is normal to feel overwhelmed. If you’re feeling like it’s hopeless to fight back, you’re not alone. It’s important to keep fighting the good fight, and stand up for the rights of the vulnerable. So what can you do to combat feelings of hopelessness? After the devastating results of the November elections, there’s a lot of talk about how now is the time to be unified. Unity is both a principle value and tactic that has seen our social justice forbears through some of our darkest days. But if you’ve worked in coalitions or alliances you know that being unified is easier said than done. So to help, I’ve put together this set of suggestions, tips, and lessons that we who want to build unity should know as we walk that path. Working together in groups and coalitions is difficult and requires effort. Here are some things you can do to make that effort worth it. Learn to be uncomfortable. Working with new individuals and groups exposes you to situations and ideas you might not be used to. People will propose tactics or actions you think won’t work. You may doubt your new comrade’s experience or intentions, or question their commitment. Your reflex/instinct might be to discount them or criticize their ideas or distance yourself immediately. Doing so could keep you from understanding where they are coming from and what experience they have to bring to the table. Notice those urges and allow yourself to feel them. Just because you experience the urge to criticize does not mean you have to act on the urge. Make space for the urge and act in the direction of understanding and patience. In addition, you may be exposed to people who have different backgrounds, cultures, or life experiences than you or that are not of your same race or ethnic group, and you may not be immediately comfortable being around them. You might come up against your own prejudices or realize your lack of understanding/awareness of the issues members of their group face. It may make you feel out of place or like you can’t be a true comrade with people of that group. Begin to learn about social groups you’re unfamiliar with even before you start. If you need to build alliances across social groups, start learning about the issues those social groups generally face. If you foresee joining efforts with Arab or Muslim groups, find and follow some Muslim thought leaders on social media, starting with following Linda Sarsour on Facebook. If you’re going to work in a coalition with LGBTQ folks, read up on South Carolina’s bathrooms bill or the issues facing trans folks of color. 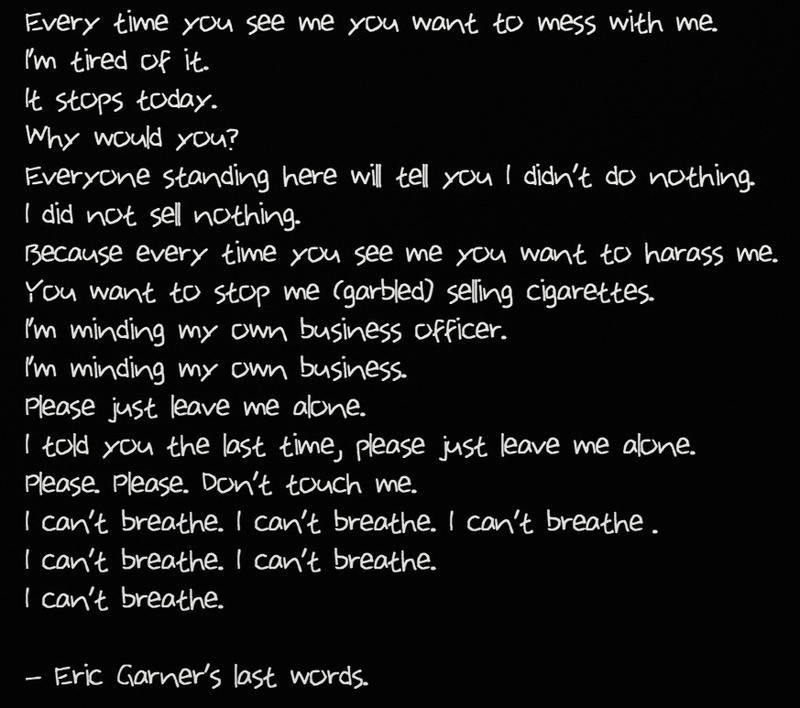 Follow #BlackLivesMatter founders @osope, @opalayo, and @aliciagarza on Twitter. It’s not going to make you an expert, but it will begin your own path toward solidarity with folks in those social groups. Take the lead of those directly impacted. Undocumented folks know more about the impacts of our outdated immigration system than any immigration expert. Trans people of color have a deeper understanding of state and interpersonal violence than perhaps any other group. People who are directly impacted know about their community and know what is needed to address their issues and to mobilize their community members. Don’t assume leadership roles that those directly impacted are able to take. And if you are already in a position of leadership, make sure you are working to build up the leadership of those directly impacted so that they are able to step into positions of leadership. Set common goals. When building a coalition, keep the agenda short and values-based. Keep the target simple and have a goal. Don’t get stuck in the rut of trying to write an academic manifesto that includes everyone’s theory of oppression and customized vision for utopia. Set goals and go after them. Encourage the use of acuerdos/norms. Organization and coalition meetings can get out of hand fast. There’s nothing like an unorganized meeting to turn people away from organizing and ensure nothing ends up getting done. Acuerdos, when they are created and agreed upon collectively, can be a powerful way to maintain order in meetings while at the same time enriching participation and building unity (opens a PDF doc.). Acuerdos aren’t a substitute for strong relationships with the folks you’re organizing with, but they do help maintain organizing spaces as spaces of mutual respect — ask long as they are adhered to. Address prejudices and discriminatory behaviors. Don’t give someone’s misogyny, homophobia, paternalism, etc. a pass in the name of unity. Unity is build on solidarity and trust and our individual acts of discrimination undermine both of those. If someone truly wants to contribute to the unified effort, they will be open to improving on their shortcomings and changing their detrimental behaviors. There are good ways and there are bad ways to address the behaviors that undermine unity. Learn to do so in a positive and productive way, but don’t shy away from putting your foot down and kicking someone out when they fail to keep their prejudices and discriminatory behaviors in check. Not doing so could have far greater consequences. Examine your own prejudices. We all bring prejudices to the table. Not a single one of us is outside the socialization and dominant ideologies of our society and all of us have learned prejudicial thought processes. But that doesn’t mean that our prejudices have to impact our actions. The key is learning how to see thoughts for what they are — just thoughts. We can challenge the assumptions that underline prejudice by learning about the different social groups toward which we have prejudices. At the same time, we can learn to identify the thought patterns that reinforce our prejudices so as to take away the power they have over us. Acceptance and Commitment Training is a powerful and simple (but not always easy) way to identify our own prejudicial thought patterns and set them apart so as to not allow them to direct our actions. Learn to take criticism. Working together with new people often means learning that some of your ideas or actions are considered unacceptable, damaging or offensive to others. Often times it’s behavior you don’t consider disrespectful and no one’s brought to your attention previously. Criticism can trigger our fight or flight response and our initial reaction is often to become defensive. But defensiveness is not a very useful quality for building relationships of solidarity. So in the face of criticism, recognize that it’s okay to feel defensive, but don’t let your actions be driven by defensiveness. Remember the tips above on learning to be uncomfortable and allow yourself to feel defensive, but practice constructive ways of responding to criticism. Consider your audience. In your organizing work, learn all you can about the groups of people that you need to move to achieve your goal. You have to meet people where they are, not where you want them to be. You hone messaging that connects with people where they are and then shows them a path to where you need them to be and invite them to journey down that path. In mass media and social media organizing, this means using communications techniques that start with what we have in common, moves toward the problem and what can done to fix it, and ends with an action your audience can take to help fix the problem. A powerful example of this is the Opportunity Agenda’s Values, Problem, Solution, Action messaging framework. In face-to-face organizing, meeting people where they are means asking questions more than giving answers. You don’t tell them why they should care. They tell you why they should care. It means learning about their lives and hardships and THEN showing them (not telling them) how their involvement in a movement can lead to the change they need in their lives. Another communications tip: write in first person plural, i.e. “we.” YES: “When we unite together we have the power to make our leaders listen and make the change we want.” NO: “Join us so we can win.” It’s a deceptively subtle difference, but an important one. Know when to walk away. Coalitions are rarely permanent. Allies are not forever. Not all alliances are healthy. If you are in a coalition that has passed it’s point of being strategic, if you see that group dynamics are unhealthy and not improving, if your group has lost its way and is no longer working in the best interest of the community, don’t feel bad about cutting your losses and moving on. When you can’t work together, at least coordinate. One of my biggest frustrations with coalitions is the assumption that if groups are not working together under the banner of the coalition, they have to work independently of each other. Often times this causes groups working toward the same cause to not communicate and share plans and strategies with each other, sometimes resulting in conflicting plans and strategies. In practice, groups who are not working together can still coordinate. This can be as simple as sharing with each other the dates of major events so as not to create conflicting events. But it can go farther. For example, during Texas’ legislative session a few years back, two statewide coalitions and a coalition from one of Texas’ major cities coordinated the timing of their legislative activities around immigration so that lawmakers were hit with three different days of action spread a month or so apart. Don’t give up easily. Working with others is hard, there’s no doubt about it. But struggling against oppression and winning victories for social justice has never been easy. We have all come up against hardships in our lives and overcome them. Draw strength from your personal struggles and victories, and remind yourself how capable your are. If you are strong on your own, imagine how much stronger we will be together? If you have additional tips for building unity or working for justice in trying times, leave them in the comments section. Follow these simple steps when someone calls you out. You’re a caring and decent person. But someone just called you out on something you did or said. As a decent human being, you don’t think you routinely do things that are damaging or hurtful, and for that reason your first reaction might be to get defensive and defend yourself. But like all people, your actions can sometimes have unintended effects on others. We might not know how damaging our actions can actually be. So in order to come out of the experience a better person, follow these simple steps when someone calls you out. 1. Listen. It’s amazing how much you don’t actually hear of what someone’s telling you when you’re preparing your come-back or defense. If in an online interaction, read the person’s response carefully. Two or three times if need be. 2. Take a second, take a breath. Don’t act defensive and respond right away. It’s okay to feel defensive, but don’t allow yourself to act on that defensiveness. If in a real-life situation, briefly draw your attention to your breath and then use that same attention to listen to what the other person has to say. If you find yourself devising come-backs, just acknowledge the thoughts and draw your attention back to the person. 3. Think about what you said or did and how it might be perceived. Did you misspeak? Were you misunderstood? 4. Think of the impact what you said or did could have on others. Do certain words you used carry baggage? Are they associated with the experiences of others, particularly groups that have been the object of oppression? 5. Think of the words the person used to call you out. Are there key terms or phrases that you can learn more about? Google them to see what others are saying about the subject. Take some time to educate yourself about the other person’s perspective from what’s available publicly. This works best when you’re called out online. If called out in person, remember those phrases and look than up later. 6. Ask for clarification or explanation. See if there is more to it that the person wants to share with you. Don’t expect them to, though, and don’t hold that against them. It takes a lot of courage and energy to speak up, especially if you’re part of the group that is targeted by someone’s damaging words or actions. Understand that and respect if the person chooses to disengage with you. If you notice yourself feeling like you deserve an explanation, just acknowledge those feelings and make space for them, but don’t act on them. 7. Consider your own defensiveness. Is it coming from a place of defending your ego? Is it a force of habit? What do you have to lose by considering the other person’s perspective and/or conceding your own position and apologizing? What do you have to gain by doing so? A better relationship with the person? A better understanding of the experiences of people different from you? A better handle on your ego or impulsiveness? 8. Respond how you see fit, but always with the care, respect, and courtesy that you would show toward an equal. Regardless of how rough or disrespectful the person might have been to you. Sometimes when you or the group you belong to is the constant target of damaging language or acts, you get angry and build up rage. That can come out as an attack or disrespectful language when calling out someone who employs damaging language or acts. It is also possible that you have a different idea of respect: what you consider disrespectful the other person does not see as such. If the interaction is an online one, why not using your time looking up some of the key terms or phrases from step 5 instead of responding? 10. Continue being open and learning from the plethora of experiences and people around you. Thanks for being a voter. It shows that you care about your community and the good of this nation. Tomorrow is the last day to vote! Tomorrow, Tuesday, is Election Day for Texas’ constitutional amendments, which means voters need to vote at the polling place that corresponds to their precinct. (Next time, don’t miss Early Vote, when you can vote at any polling place in the county where you’re registered). Don’t know which precinct you live in? Have no fear! This little guide will have you knowledgeable of your precinct and polling place in no time. First, you will need to know your voter precinct. 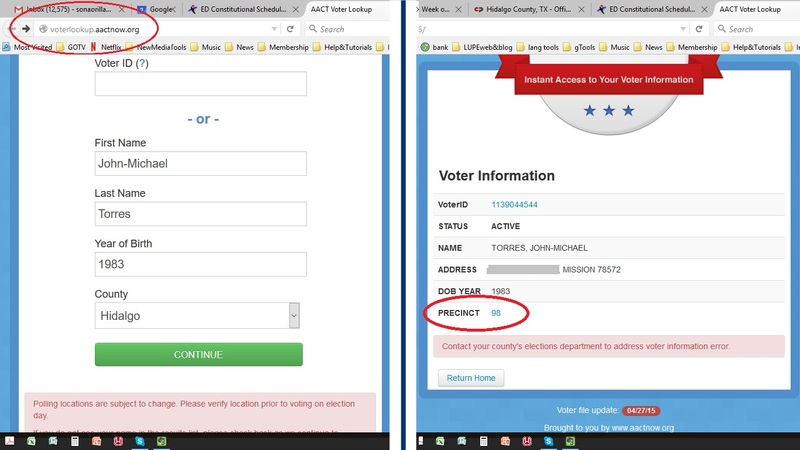 You can use the easy, simply designed AACT voter lookup to find out which precinct you or your friends/family live in. For example, I put my name, year of birth, and county into the AACT voter lookup, and found that I am in Precinct 98. Then, head over to the Hidalgo County Elections Department website here and pull up the Election Day Schedule (a PDF document), which includes polling places. Use the precinct number you just found on the AACT Voter Lookup and look for the polling place that corresponds to your precinct. 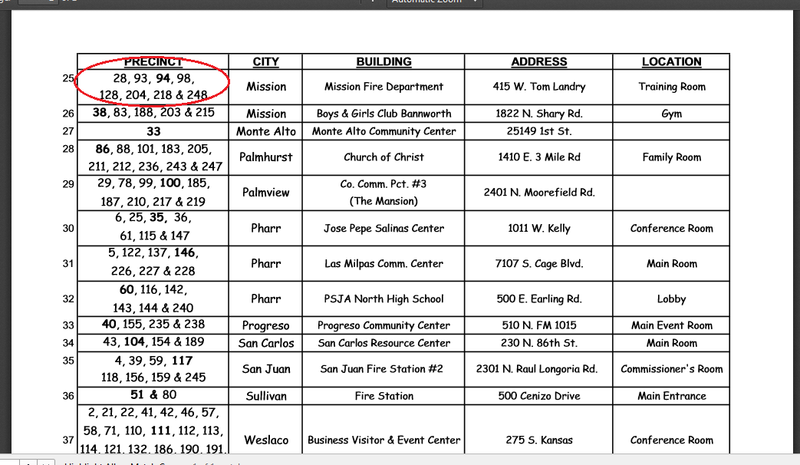 I searched for 98 in the polling places list and found that I need to vote at Mission Fire Department. Thanks again for being a voter. Happy Voting! After attending the Mental Health Conference in Edinburg last month, I’m blown away by the amount of mental health services in the Valley provided by licensed counselors, psychologists and psychiatrists, who offer their services regardless of an individual’s ability to pay. I visited the websites of each of the service providers and picked out the info I thought would be most useful as you decide where to go for help. This post is aimed at individuals who worry that they cannot afford to seek help for emotional or mental problems, or painful internal, private events that are making it difficult to live a meaningful, fulfilled live. If you have insurance and can afford help, check out this therapist locator tool. Many therapists offer their services using a sliding scale to help you afford their services. Some of the providers listed below may also serve individuals with insurance. Important: If you are experiencing a crisis, having thoughts of hurting yourself or another person, or considering suicide, call the toll-free crisis line at 877-289-7199.